Children’s feet are soft and pliable making them prone to damage from abnormal pressure, such as shoes that are too small. Foot care can begin in infancy by keeping your baby’s feet free from constriction. Grow suits should always be loose around your baby’s feet. Making time for your baby to kick freely will help with the development of the muscles in the legs and feet. Children usually begin to walk any time between ten and 24 months of age. It is important to remember that each child is unique and will move through the developmental stages at their own pace. Each child follows a developmental sequence from lying to sitting, crawling, standing, cruising, walking to running, jumping and hopping. When your child first begins to walk, shoes are not necessary indoors. 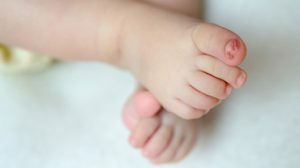 Allowing babies to go barefoot or to wear just socks helps the foot to grow normally and promotes the grasping action of toes. Sometimes children walk with their feet pointed inward (in-toeing) or outward (out-toeing), other children walk on their toes (toe-walking). In most cases, these variations in walking are normal. Most children will have grown out of these walking styles by the age of two. However, if these patterns persist, or you have concerns, you should take your child to a podiatrist. Arch development is also an individual thing and tends to stabilize by six or seven years of age. Arch height does not always indicate that a child will have problems with their feet. A child’s feet will double in size by the age of one and they are approximately half their adult length by 18 months of age. Between the ages of five and 12 growth is approximately 9mm per year, with adult foot size approximated by twelve to fourteen years of age. Frequent changes in the size of shoes and socks are necessary to make room for rapidly growing feet during childhood. Do a size check at least every one–three months up to the age of three, every four months up to five years and every six months from five years. It is important that shoes are fitted by a specialist in children’s footwear to avoid injury and discomfort. Heel pain can also occur in growing children, usually between the ages of eight and 13, as they increase their participation in sporting activities. Problems with the skin or nails on your child’s feet may occur from time to time. Some conditions (in-grown toenails, athlete’s foot and warts) require treatment from a podiatrist, while others may be helped by changes in hygiene or shoes. Washing feet and keeping them dry and clean helps to avoid irritation. Ensuring children change their cotton socks daily and air their shoes overnight should also help to reduce skin problems. In-grown toenails are often caused by trimming toenails too short or by damage to the nail. Nails should be cut straight across and should be no longer than the tip of each toe. Plantar warts that appear on the sole of the foot tend to be hard and flat, with a rough surface and well-defined boundaries. They can grow into clusters and become painful if left unchecked.